An onboarding program, including in-the-field training for all team members, is part of LandCare’s new staffing philosophy. As good employees become more difficult to find—and keep—LandCare, a commercial landscape maintenance company with more than 50 locations across the U.S., has adopted a new philosophy: train to retain. In its attempt to improve employee retention, LandCare revamped its onboarding process and now requires every new hire in the support staff and management departments to spend about three days in the field for a hands-on training, regardless of previous green industry experience. Additionally, it offers them a taste of the company’s culture, says Christenson. Since LandCare made the change about 12 months ago, Christenson says the company has made significant strides in employee retention. The program, which was initially geared toward new hires who didn’t have prior green industry experience, provides a basic, ground-level understanding of the landscape industry. On the other hand, for those hires who already have industry experience, the redesigned orientation provides a more robust, in-depth look at LandCare’s operations. On their first day, LandCare’s newest team members are paired with a branch that’s close to their office location. They’re given safety gear and instructed to wear suitable attire—such as pants and a long sleeve shirt—and report directly to the crew leaders. A newcomer to the green industry and a new hire at LandCare, Communications Specialist Isidoro Balistreri experienced the onboarding process firsthand when he started in July. He says initially he was surprised that he would be spending his first week in the field, but he soon understood the program’s purpose. 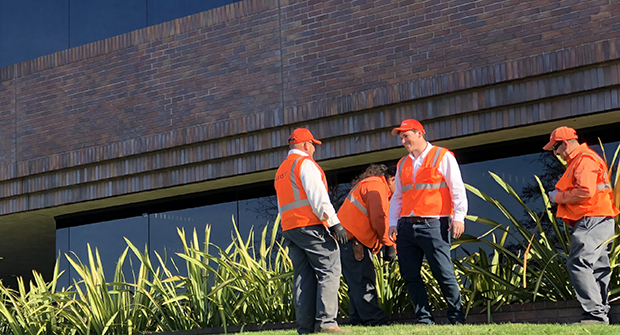 His first day, he underwent a safety training relevant to the tasks he would be performing and shadowed the management staff at the company’s San Diego branch. He began the next three mornings with a 15-minute stretch and flex before heading out with his designated crew for the day. During his three days in the field, Balistreri shadowed a maintenance crew, a single-site supervisor and an enhancement team, performing tasks like pruning, cleaning and cutting plant material. He also learned how to operate some equipment, such as leaf blowers and hedge trimmers. In addition to gaining basic industry knowledge, Balistreri says the experience has helped open up lines of communication between branch and corporate levels, enabling corporate to gather feedback and crews on the ground to give suggestions. He says the orientation also showed him how the branches communicate with customers, giving him insight into the types of marketing materials the branch might need to best appeal to its customers. For landscape companies who want to revamp their onboarding processes, Christenson says it’s critical to partner the new hire with someone who is willing and able to train that person in the field. She says that creating a culture of training is also important. It’s also crucial for the new hire to undergo safety training before being out in the field, she adds. Balistreri says that selecting an appropriate length of time and relevant job sites is key.